The Maruti Suzuki Swift comes with a boot space of 268-litre. This means, the hatchback can afford generous amount of luggage at the back. Being a family car, the hatchback certainly deserves ample space at the back for luggage and the Swift certainly comes promising enough space for luggage there at the back of it. Apart from the cubby holes and cleverly designed storage compartments in the cabin, this boot storage capacity adds practicality to the car. The boot space of Maruti Suzuki Swift compares with that of Volkswagen Polo, Maruti Suzuki Baleno, Hyundai Elite i20. The boot space of Maruti Suzuki Swift is 268 litres, whereas the boot space capacity of Volkswagen Polo is 280 Litres. 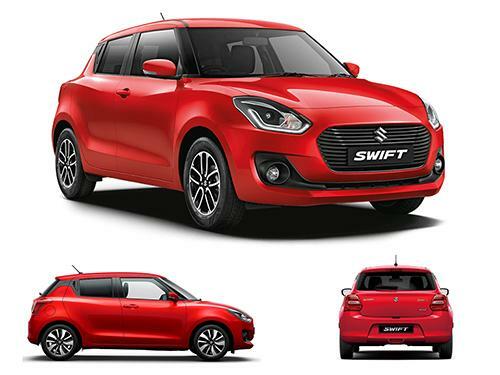 On the other hand, Maruti Suzuki Swift boot space competes to Maruti Suzuki Baleno with 339 Litres of boot space, and Hyundai Elite i20 having 285 Litres of boot. Generally, it's considered a great deal if the boot space capacity of a car is beyond 300 Litres, whereas, boot space below 300 litres isn't recommended if your primary goal of buying a car is boot space.